Current freshwater availability is reducing because of climate change, rapid urbanization, and an increase in population. Due to these situations, the identification of alternative water resources has become a main focus of research world-wide. Among all alternatives, stormwater has been found as most promising for reuse and recycling. The rapid development of urban and suburban areas has limited the natural infiltration of storm water because of increased impermeable areas, which in turn, increase the risk of urban and suburban flooding. Urban and suburban stormwater runoff carries a significant amount of pollutants, such as heavy metals, hydrocarbons, pesticides, and bacteria. The sources of pollutants and their contribution to urban stormwater runoff are highly dependent on the land use pattern. These pollutants are harmful to the environment and a threat to human health at higher concentrations. In order to maintain healthy waterways, it is necessary to develop sustainable management of stormwater. 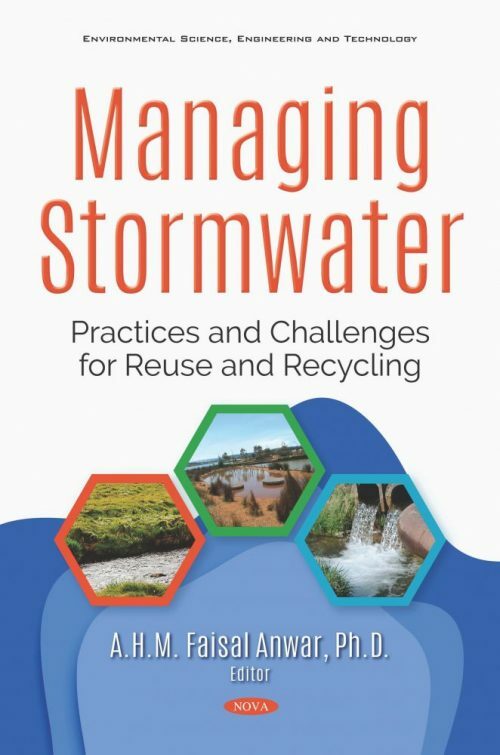 Stormwater management practices involve many challenges for its reuse and recycling, which are the main focus areas of this book. Available management practices consist of collecting and discharging the stormwater into rivers, ponds, or nearby retention basins. The best management practices (BMPs) may include oil and grit separators, grassed swales, vegetated filter strips, biofiltration/bioretention ponds, constructed wetlands, gross pollutant traps, and catch basin inserts. This book has eleven chapters that describe the practices and challenges of different BMPs for stormwater management. These include combined sewer networks, different rainwater harvesting techniques, constructed wetlands, MUSIC modelling of bioretention systems, catch basin inserts, permeable pavements, the use of adsorbents for cleaning stormwater, low impact developments, and membrane-based technologies for stormwater treatment.